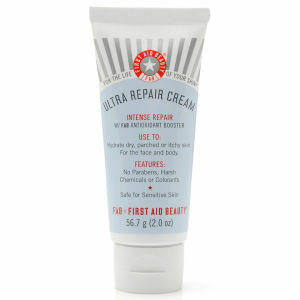 First Aid Beauty Ultra Repair Cream (170g) is a grooming essential for anyone who suffers from dry and flaking skin. It penetrates deep into the surface, delivering fast relief from itchiness and irritation. The formula contains soothing oatmeal, moisturising shea butter and cleansing eucalyptus oil. If you enjoy using natural products this cream is ideal, as it contains no parabens, no chemicals and no colourants. 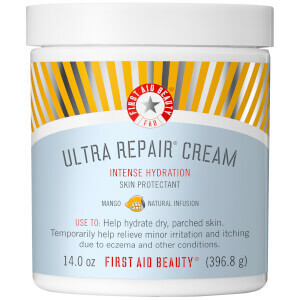 First Aid Beauty Ultra Repair Cream can be applied freely to sensitive skin all over the face and body as needed. Simply smooth on a thin layer of the cream after a bath or shower, or before dressing in the morning. THE THIRED TIME I BOUGHT THIS CREAM,IT HELPS ME SURVIVE ALLERGIES, SO GENTLE AND CHEAP! A strong moisture cram for dry skin! Strongly recommend for who is dry and sensitive skin!! My family has coarse pore and after use this cream have been smaller, it is a amazing product! Simply the best thing for your parched skin. Its comfortable but not heavy and gets the job done. Makes my skin supple. I use it on my face as a night cream and on really dry days during the day as well. I have been using this cream for over 1 week now and no difference. Waste of money! Very good product in terms of its moisturing ability. Gentle and easy to be absorbed by skin. The product is good, but it comes with a cracked box, unsatifed postage from hqhair. 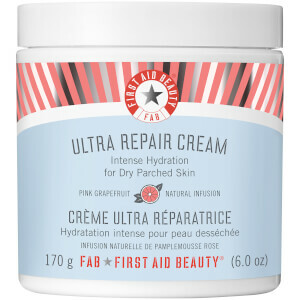 First Aid Beauty Ultra Repair Cream (170g) is a grooming essential for anyone who suffers from dry and flaking skin..